Elected deputies met today in the first inaugural session. Plenary sessions were attended by 97 MEPs out of 101. The meeting was chaired by the oldest deputy, the socialist Eduard Smirnov, who had difficulty expressing himself in Romanian, even if he read from the paper. "According to the Decree of the President of the Republic of Moldova no. 1137 of March 20, 2019, the Parliament of the 10th Legislature is convened in a special session. 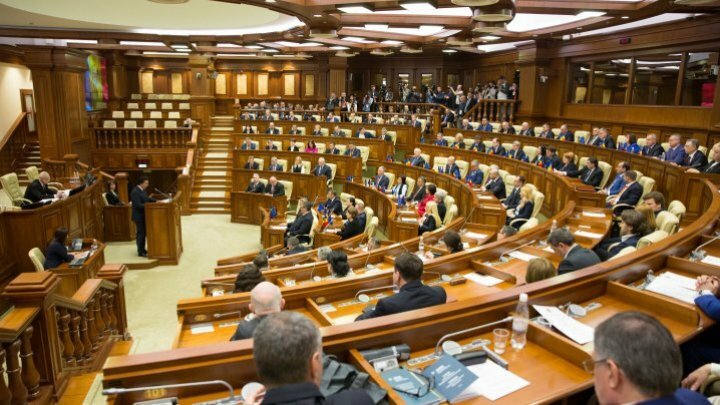 Solemn constitution meeting of Parliament and formation of working body is held", declared PSRM. "The Constitutional Court's decision succeeded the report of the International Election Observation Mission of OSCE observers and the Parliamentary Assembly of the Council of Europe and the European Parliament according to which the parliamentary elections of February 24, 2019 were competitive and fundamental rights were respected. " President Igor Dodon also said that he would soon invite each party to the presidency to discuss the formation of the parliamentary majority. "The foreign policy of our state must be not so pro-European or pro-Russian, it has to pro Moldova, oriented primarily to the national interest of the Republic of Moldova. We have no power to decide the great politics of the world, but come to have the wisdom of not making room for maneuver in this global policy, "said Igor Dodon, the country's president. The head of the Democratic Party faction, Pavel Filip, hopes that talks on forming a majority in parliament will begin next week. "The Democratic Party has tried to have discussions with those in ACUM bloc, because if these discussions had been concerned, maybe this meeting would be more effective. I hope very much these discussions will start next week, "declared Pavel Filip. Parliament's meeting was not without joke. Marina Tauber of the Shor Party brought a sun visor that she used as a barrier between her armchair and the nearby PAS-PPDA deputies. "I have to start the meeting with something more unpleasant, because, dear colleagues, before I make certain statements and announcements, I want to protect myself from this block. ACUM bloc, Nastase was poisoned with mercury, as he declared lots of times", emphasized Marina Tauber. "Moment, my colleague, a special meeting takes place today, dedicated to the constitution of Parliament. According to the regulation, questions, debates, ... are not foreseen", said Eduard Smirnov. Because Eduard Smirnov couldn't calm the spirits, he addressed Sor deputy in russian: Madam, do you have a faction? Later, Andrei Năstase was asked by journalists to comment on Marina Tauber's gesture: We are sorry, but the best doctors are not here in this hall". At the meeting, three parties announced that they had constituted their parliamentary factions. The PSRM, with 35 deputies, will be led by Zinaida Greceanii. The Democratic faction is composed of 30 legislators, and Pavel Filip was elected president. The faction of the Sor Party, led by party leader Ilan Şor, was also formed. The Block ACUM is the only one that has not formed its faction.